When Shaggy and Scooby win tickets to WrestleMania, they convince the entire Mystery Inc. gang to travel to WWE City in the Mystery Machine to enjoy the show. But the trip quickly turns into another mystery as WWE City is full of secrets! A mysterious ghostly bear appears and threatens to ruin the show and steal the championship title belt. With the help of WWE Superstars John Cana, Triple H, Sin Cara, Broadus Clay, AJ Lee, The Mize, Sandino Marcella and Kane, Scooby-Doo and The Mystery Inc. gang team up to solve the case before it is too late! 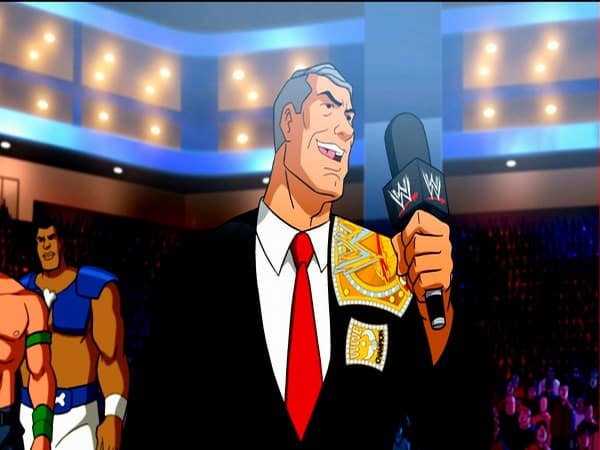 Behind the Scenes with Scooby-Doo and the WWE Gang: A behind-the-scenes look at the voice recording sessions of cast of WWE. John may be pushing forty, but he’s still a kid at heart. 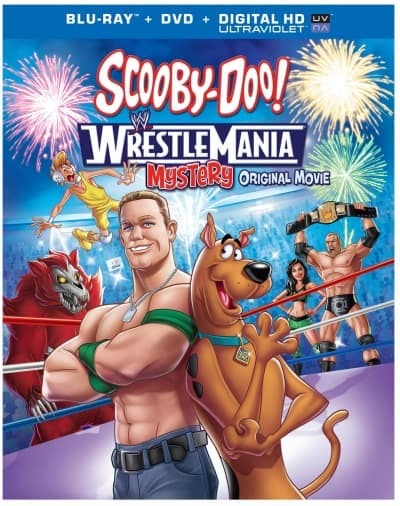 When I heard that Scooby-Doo and gang had joined forces with the WWE for the first time ever, I knew that he would definitely want to see this movie. Just a quick sidenote: a few weeks ago John came home from his trip to NB with a new tattoo. I was surprised to see it because he wasn’t talking about getting one, but I guess the opportunity came up and he went for it. Guess what the tattoo was? Scooby-Doo and Shaggy. No kidding. Anyways, we sat down to watch Scooby-Doo! Wrestlemania Mystery the other night. I watched Scooby-Doo as a child and also with both my daughters who are fans too. This movie features all our favourite characters plus many big names from WWE. I don’t watch wrestling at all so none of them were familiar to me, but John was calling out all their names and telling me who they were. Some of the WWE superstars included John Cena, Triple H, Sin Cara, Brodus Clay, AJ Lee, The Miz and more. Sgt Slaughter was also in the movie and John informed me that people at work used to call him Sgt Slaughter because of his moustache and uniform. I guess I see the resemblance a little bit?! Scooby-Doo! Wrestlemania Mystery was a fun movie to watch. It featured the kind of mystery that is trademark Scooby-Doo and I was trying to figure out who might be behind it all for a good part of the movie. 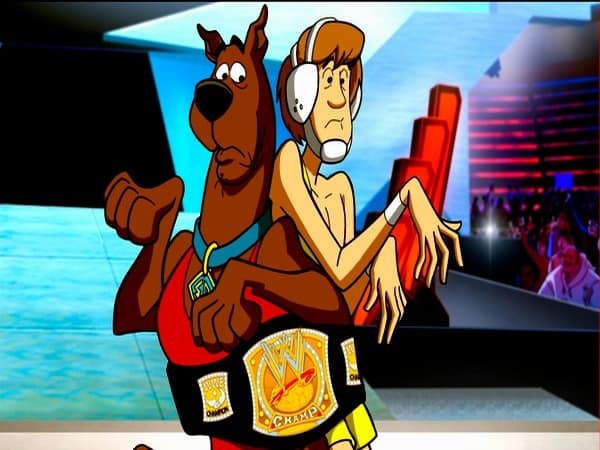 I think fans of both Scooby-Doo and WWE will enjoy the movie. Maybe I will have to watch the WWE sometime so I can see what these wrestlers look like in real life. Scooby-Doo! Wrestlemania Mystery will be available on Blu-ray Combo, DVD and Digital HD on March 25, 2014. This would be a great DVD for my granddaughter, Love Scooby-Doo!